– Add any Unicode character to your font’s glyphs repertoire. – Design once the Basic-Latin character set and the Diacritics, FontArk will create all the accented Latin characters for you. Any change or modification of either Basic-Latin character or diacritic will automatically update all the relevant accented Latin characters in real time. Up to this upgrade, FontArk supported only the Basic-Latin Unicode block of characters, 94 glyphs in total. 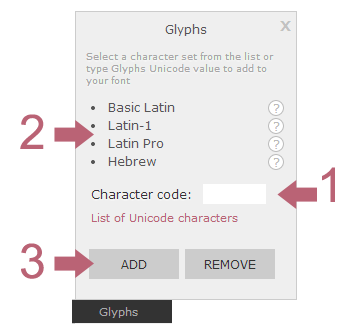 With this new feature you can now add Any Unicode character to your font by simply typing it’s Unicode value to the input field in the Glyphs dialog (1) and click Add (3). The new Character will be added to the bottom glyphs preview. It will be blank, a watermark will display the character’s general form and it’ll have the same Matrix as the rest of the font’s characters. In case you plan to add complex characters to your font, make sure you start your font with a proper Matrix (7×7) because the Matrix is fixed for the entire character set and can’t be changed during the design process. (The Matrix you start your font with is the one that will be used all the way). In order to make it easy to add common Latin characters we’ve created two character blocks (in additional to the Basic-Latin block) to be added to your font in one-click. Also known as the Latin-1-supplement Unicode block, FontArk’s Latin-1 is a set of 56 characters covering the French, German, Spanish, Icelandic and Vietnamese scripts. Afrikaans, Basque, Breton, Catalan, Danish, Dutch, Faroese, Finnish, Gaelic, Indonesian, Irish, Italian, Javanese(Latin), Malay(Latin), Norwegian, Portuguese, Sami(Southern), Swahili, Swedish and Walloon. Including also important mathematical operators, dashes, currencies and special punctuation. Accented Latin characters are widely used in Latin scripts other than English. About 15 diacritics are used to accent most of the Latin characters. The Latin A for example is accented in various languages more than 9 times, À Á Â Ã Ä Å Ā Ă Ą, add to it the lower-case a, and all the other accented Latin characters and you get a great deal time consuming repetitive work to do in order to complete a multilingual font. One of FontArk’s main philosophy rules are to use computing power to do all the repetitive work, and this one is a classic to automate! With FontArk now, all you have to do in order to cover 173 accented Latin characters included in the Latin-1 and Latin-Pro sets is to design the Basic-Latin characters (which you will anyhow in most cases) and the 15 diacritics. FontArk’s engine will automatically and in real time, Match the characters and diacritics in the relevant glyphs. Any change made to one of the Basic-Latin characters, including spacing, weight and proportion changes, will immediately be updated in the relevant accented glyphs. The first row (1) is the Diacritics row, colored with a pale green background. This is where you design the diacritics, and this is the source for the accented characters diacritics. Any change and modification to the diacritics applied here will update the diacritics in all the accented characters! The second row (2) is the Accented characters row, colored with a pale blue background. This row will be automatically populated with the relevant Latin character and diacritic. The characters and diacritics in this row can’t be edited directly, if you want to edit the shape of the character/diacritic in any of these glyphs you’ll do that by modifying the relevant Basic-Latin characters and diacritics (from the pale green row (1)). At first, when adding Latin-1 or Latin-Pro, the diacritics are positioned arbitrary somewhere in the glyph area. The auto position diacritic button (1) will position the diacritics of all selected glyphs in a preset position. 1. Select all the glyphs you want to auto position it’s diacritics 2. Stand (make active) on one of the accented glyphs (this is important because the Auto-position button will not show up unless you stand on one of the accented glyphs!) 3. click on the Auto position diacritics button (1) (on the right panel). 4. All the diacritics of the selected glyphs will instantly “jump” to it’s designated position. – Some of the accented characters, for example Ø- Oslash, Ł- L with stroke, and others, don’t have a diacritic! we’ve placed in it’s glyphs the origin character (O, L) but you have to draw the slashes/strokes manually in these glyphs and as well as fix it’s position with any change to the character’s proportions. – Some characters diacritic auto-position might not be “perfect”, so pay a careful attention to each and every glyph of the accented characters to find those that need manual adjustments. – You can manually adjust the position of each and every diacritic by dragging the blue control point(Dragger) positioned in the center of the diacritic to the desired position, or type in the desired X,Y coordinates of the diacritic in the right panel’s Dragger-info inputs. (click on the dragger to make it selected/active (it’s color will turn from blue to red)). You can re-position this way one or more diacritics simultaneously, this tool is applied to all selected glyphs. If you’ve manually positioned the diacritic of a certain character and you wish to imply the new position to some other characters as well… 1. stand on the re-positioned glyph 2. select all the other glyphs you want to compare the diacritics position 3. Click the Compare diacritic position button (2) on the right panel 4. All the selected glyph’s diacritics will be positioned in the same position of the active glyph. 1. Change work area layout (1) – clicking on it will expand the work area vertically, clicking it again will shrink it back to fit the screen. Notice that in the expanded mode the glyphs display is pushed down outside the screen, so you’ll have to scroll the window a little to view the glyphs and select characters. 2. Change glyphs preview layout (2) – Clicking on this button will expand downwards the bottom glyphs display, exposing the entire characters repertoire! Click again and it’ll go back to fit your screen. This upgrade apprises the end of several bugs and dis-functioning in FontArk’s engine increasing FontArk smoothness and reliability. FontArk’s most used templates has been improves and refined further more, as well as added diacritics for making it faster and easier for you to add the new Latin-1 and Latin-pro glyphs to your fonts and let you explore the new functionality of these new features. It’s been a while since our last upgrade but we hope this important and massive new upgrade will worth the waiting as we’re constantly working on making FontArk the best tool for type designers and type enthusiasts out there. April's upgrade - With focus on usability.December 2014 upgrade - Advance Outline Editing is here!